Bertrand Russell, “How to Grow Old,” Portraits from Memory and Other Essays, 1956. I have an article coming out soon in an anthology. Rather than starting from an old academic bio for the requisite author biography, I started from a helpful “how to grad school” outline. When I was in grad school and the Wild West internet was new, I had no such outline. I love doing all of this over again. Lori Elaine Taylor is an independent scholar with a specialization in propaganda, persuasion, and the slippery stories people tell themselves about their collective pasts. Her work includes religion and racism, music and music communities, and labor history. Lori completed her Ph.D. at the University at Buffalo and her M.A. at The George Washington University. The John Whitmer Historical Association awarded her “Best Dissertation” for “Telling Stories about Mormons and Indians.” She recently published flash fiction, “Latter-day Confederacy of Many Nations,” in the alternate history anthology, States of Deseret. Her superpowers are writing Python and speaking Finnish. Given the ugliness of the past week (and the past six months, and the past two decades, and the past five centuries), I’ve been thinking about antiracism. I see definitive, must-do lists of actions every day telling me the exact ways I must fight racism. Layering universalizing assumptions over the desires of so many people to take action can be confusing—or maybe confused and misguided. I don’t buy into universal answers to racism or to much else really. I do believe Nazis should be punched, but I understand my pacifist friends rejecting Nazi punching. I’m comfortable with a range of approaches to deal with hate in the streets, in our institutions, and in our hearts. You and I stand in different places, and we arrived here by different paths. Our approaches are inevitably different even when we are all anti-racist, anti-fascist, anti-hate. So, I haven’t made a public declaration, but I do want to tell you how I shaped my life to fight racism. In college I saw up close how my friends who are people of color were drawn out of the bounds of acceptable norms. Sometimes it was blatant, but the subtle racism was sometimes worse because it was so shocking. I will never forget the gut-punch of the nasty looks I got from white people for daring to walk hand-in-hand with a person of color. I let that sadness and anger I felt stew for a long time. After doing Master’s work on music communities, I was frustrated with how trivial music was for most people when it was so serious for me. I decided to do my doctoral research on a subject that would make everyone uncomfortable: religion and racism. I took that gut-punch and a decade of my late-adolescent anger and poured it into research on the ways (white) Mormons try to frame American Indians as objects under their universalizing umbrella of One True Whatever. I chose my topic because of personal love and cultural heart break. I spent more than a decade reading like a plough (because that’s what I do), and I finally wrote 435 angry pages, anger barely veiled in polite academic language: Telling Stories about Mormons and Indians. Note: I was eight months pregnant when I defended my dissertation. I edited all and wrote many of those pages while pregnant. I even referred to my baby in the acknowledgments by the girl-name I chose for him, since I was so sure he would be a girl. Yet, he is still a boy, and he is now 17. He’s the kind of compassionate, angry, smart kid I would expect of someone who experienced this dissertation with me. It is not inevitable that I address the issues of memory, history, authority, and the sacred through Mormons and Indians. That developed through my experience. I am a native of the group. I grew up in the cultural core—on the Mormon reservation in Utah, as someone pointed out to me. I have been privileged in color (white) and genealogy (with seven generations of Mormon ancestors before me), othered in gender (woman) and maybe in politics and culture. From this place, a place of no particular authority other than the currency of my academic degrees, I create a representation of my own situated knowledge of Mormons and Indians. I want to know more about the root causes of consequences I see among people I know. I have watched the culture I live and love break the hearts of people I love through Mormon Indian doctrines and programs and the deep assumptions that surround them. I want to know why. As I have attempted to find out why, I have learned many interesting stories. The last section of my dissertation was a short statement on antiracism. To me, then and now, everything boils down to the need for each loving person to walk their own path toward consciousness and improvise antiracist actions in their life. 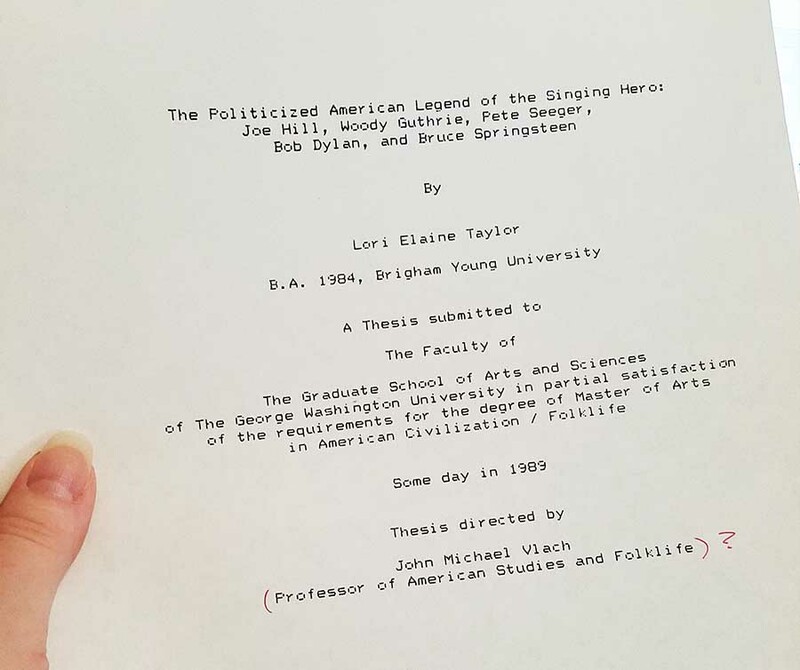 After some Twitter interaction about Bob Dylan, I heard from two people that they would like to read my Master’s thesis: The Politicized American Legend of the Singing Hero: Joe Hill, Woody Guthrie, Pete Seeger, Bob Dylan, and Bruce Springsteen (Master’s thesis, The George Washington University. 1989). I did request that people let me know if which of my articles and other works they would like to see next, so this is next. I don’t have any idea where my final copy of it lives now, but it turns out I sent my mother a near final draft (“Some day in 1989”? ), and I found this copy in her papers. Slowly these 144 dot-matrix pages will be digitized. Note: In 28 years plus, a lot has happened to extend the narratives of singing heroes. I aspire to tell that story, but this story is frozen in the late 1980s. Bonus: Eleven years after my mother’s death, I’m hearing her in my head as I read her notes on this copy. I still have a difficult time reading her writing. Not a bonus: I find plenty of opportunity for pain while reading my 21-25-year old self’s cringe-worth version of academic speak. I wrote this after I worked as an editor for a publishing house, writing back cover copy, following my boss’s orders to “Pop it up!” So, it’s better than it could have been. A generation working in marketing leaves me better at popping it up now, so I only see the gap in my voice (and grammar) over time.